Save Versus All Wands: Why Do Players Enjoy Being Puppets? A few days ago, I critiqued an argument given by Kotaku blogger Cecilia D'Anastasio that the history of Dungeons & Dragons was partly about how players had gradually wrested autonomy and control from an all-powerful Dungeon Master. Or, as she might have put it, if D&D is about storytelling, then in early D&D, the story was largely told by the DM, whereas now it is largely told by the players. I claimed that, if anything, this was actually the reverse of the truth. There were two caveats to my claim. The first caveat is that the movement away from player autonomy is an average trend, not an all-ecompassing law. When you look at the question, at the one extreme, you have absolute player choice with no manipulation by the DM or predetermined planning by the scenario author or authors. At the other extreme, you have players as total puppets. No D&D game in history has ever been played at either of these extremes. While I think it's undeniably true that there's much less of an emphasis on player freedom and choice now (in terms of actual play, not silly rhetoric by those such as D'Anastasio), that's certainly not how everyone plays. The very existence of the OSR is proof of that. And while I think that contemporary D&D, as promoted by Wizards, allocates much less freedom to players than, say, original D&D or early AD&D, it's at least arguable that 5th edition D&D represents a small reversal of the overall trend (when compared to, say, 4th edition). The second caveat is that while I think there's less player autonomy now, control hasn't necessarily been usurped by the DM per se. Rather much of it as been taken from the players by, as I put it, "an uncredited collective of author bureaucrats, employed by a multi-million dollar corporation." It's the scenario authors that are directing you through their story in, say, Storm King's Thunder. The DM is simply helping them to do their dirty work, so to speak. Let me, insert a third caveat or point that I didn't bring up in the earlier post. The loss of player control is actually even worse than the above suggests. Not only are current players much more, so to speak, at the mercy of the DM and the scenario authors, they're also much more at the mercy of the dice. Randomness is not the same as player choice, and can often hamper it. Now, of course, random dice rolls have always been a central part of the D&D experience, especially for combats. What I'm referring to here is the progressive replacement of determining many outcomes based on player initiated problem solving in favor of, say, "knowledge checks" and the like. This takes real autonomy away from the players. "Choice nodes" or "problem solving nodes" are replaced with "dice nodes." So, I would say that, in so far as players have ever been puppets, they're much more puppets now than they ever were. 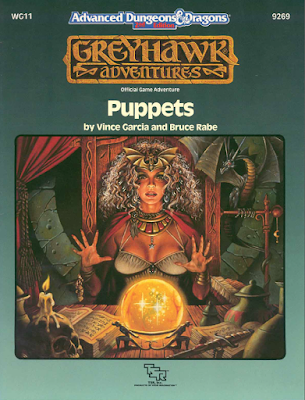 Indeed, I would say, again to speak very generally and roughly, they weren't puppets in early D&D, but they are now to a large extent, - or they are now in "official" Wizards of the Coast D&D. 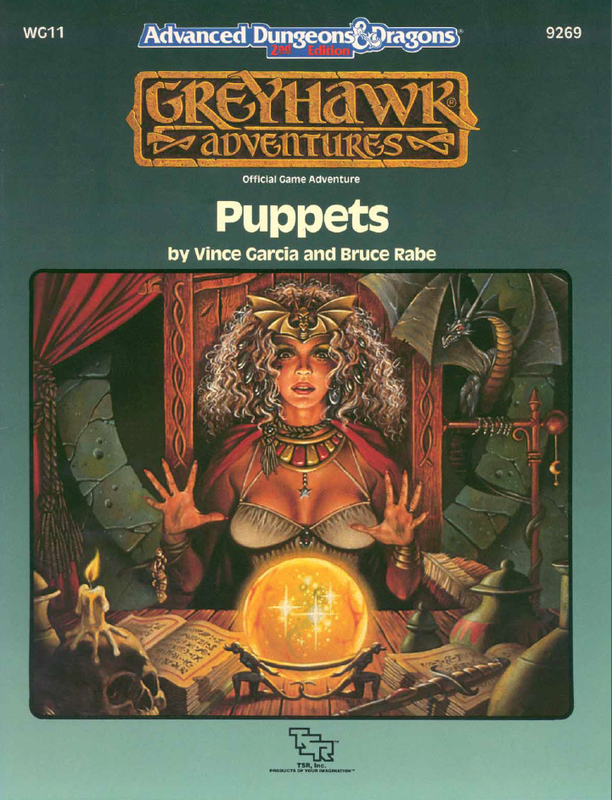 D&D may not be as popular as it was back in the day (and I would argue that the puppet thing is one reason why it's not as popular), but there is no question that the game is still relatively popular. Hundreds of thousands, if not millions of children and adults play it, and the products are, I assume, still money makers for Wizards. So let me ask (and then try to answer) a blunt question. Why do current players enjoy being puppets? 1. They don't know they're puppets. It's at least conceivable that someone could play through Storm King's Thunder and not know that the major happenings and events that they "experience" were all preconceived and determined beforehand. In the same way, many early published D&D adventures and current OSR offerings contain some "railroady" elements. It's perfectly fair to think that the players are often not aware of them, or if they are aware that they exist, they don't know which of them, precisely exist, if that makes sense. But it's hard for me to believe that this is the case with most current D&D players. If one reads the rulebooks, or any of the adventures at all, or even any of the blurbs on the back of the adventures, one can't fail to notice what's going on - "This will take your players from 1st to 8th level, as they progressively meet greater and greater challenges!" Of course, greater and greater challenges are precisely what they are not - in the same way that going from room 1 to room 8 on a Disney ride is not to confront greater challenges per se. 2. They like being puppets. To some degree, actors are puppets. They (usually) didn't write their lines, and are often told (by the director) how to say them. But that fact does not detract from the enjoyment that many actors get from their craft. It's fun to dress up in a period costume and pretend you're Richard III, etc. 3. Puppets still have some freedom. Or at least D&D puppets do. Just because the universe has already determined that you're going to fly in the cloud castle to Bryan Shander and experience the frost giant attack, and steal a conch and save Hekaton, doesn't mean that you can't goof around in the cloud castle and try out different tactics in the frost giant battle, and save Hekaton in a variety of different ways (I assume), etc. etc. And it's not like the players are sitting there with actual strings attached to their arms. A lot of playing a fantasy game is being willing to suspend your disbelief. If you can suspend your disbelief that there aren't really dragons, you can suspend your disbelief that you don't really have complete freedom in choosing how and where to proceed in a predetermined sequential adventure, such as, say, Tyranny of Dragons. 4. The puppets don't know any better. They say that bad you-know-what is better than no you-know what. Well, I wouldn't know about that, but I get the point. After my return to D&D, almost six years ago, and my shock and horror at 4th edition, it still took me a number of months to "discover" the OSR. And while I'm not an internet expert, by any means I'm not a total wallflower either. The existence of the OSR is taken as a given by many of us, but most D&D players are completely unaware of it. And if you don't know that something better exists, you're not necessarily going to have an easy time finding it if it does. I love sushi. It's pretty much my favorite food. But I didn't eat it for many years, even when my friends did. I thought or assumed that it was gross. When I started eating it, it wasn't because my preferences had changed, but, rather, because I had suddenly "discovered" it, or more accurately, I discovered I had been wrong about it. So, I don't think game preferences are completely subjective. Certain things work or work better for most people, and certain things don't. But "preferences" for most people (including me) often reflect only what we know or what we think we know. I suspect that if they knew there were an alternative, many would prefer a less puppetish existence. By using the term "puppet," I'm not trying to be snarky towards anyone, especially players (or players who "like" being puppets). But I think it's valuable to sometimes use blunt names for things. To some extent, even I think that games that treat people as puppets or partial puppets can be fun. I love Call of Cthulhu, but many CoC scenarios, especially the "classic" ones, are at least potentially somewhat railroady. In some of these, you're a quasi-puppet, being taken on a predetermined path from New York to the Himalayas to Timbuktu to East Oshkosh, etc. But it's still fun. And despite my often strong "power to the people" language, here and elsewhere, I don't believe it's all an evil corporate conspiracy. While I think that Wizards publishes many banal and inferior contemporary products, they also have republished many of the best original ones. They're not really trying to make you into a puppet or control you like a puppet (I hope). They don't care one way or another. They just want to make money. But what about you? What do you want? Do you enjoy being a puppet? All of the above. Very well-written, and you nail the key points. When I'm at a convention, I just want to hang out and have casual fun and blow off steam. The game session has a time limit, and so in-game signs saying "Go this way next!" are convenient to make sure we close the loop and complete the story in the allocated time window. I'm a home game, there can be time for the GM to pull the pins from the rails and let the players explore more and exercise more agency. Its not as critical to "reach the ending" in one play session. Howdy Oakes Spalding. This is another really great follow up, and it is very complete! I think that this is the the very nature of Modules; they are games that are repeatable, therefore they are self-limiting. Today GMs model their game designs after these repeatable collections of scenarios, which may not actually be the best idea, as the primary reason for the Module Format is to sell it. If we aren't selling it, then why restrict ourselves to that format at all? In some ways, I think that many DMs are puppets as well. On the other hand, drawing a bunch of dungeon maps and then just saying "go" seems much more doable, at least if one has the time to draw the maps. Ahh, those thrilling days of yester-year. Very well written - and not a snarky comment in sight. Totally agree with you. I have been trying for a while to comment or add to the 4 puppet versions of yours but they are well thought out! Any long running adventure module is going or have rails because one can't anticipate the actions of the players completely. This is was just as true in AD&D as it is today. Designers must write several pre-plotted scenarios for the players to run through because it is impossible to write an open world pre-published adventure. Your premise is baloney, as it has nothing to do with old school versus new school. The whole premise is a straw man... Or if not intended to be a straw man, is at best, an unintended fallacy. so a wide ranging adventure with some sandbox elements to customize like SKT is a relatively treat. To criticize these kinds of modules as treating the players like puppets is entirely misdirected. No published adventure can give a player 100% agency, not matter how short. Even B2 goes with the assumption that the players will get to the "boss fight" with the cultists. If it's okay with you, I might write a future post responding to some of the misunderstandings, non sequiturs and silly claims in your comment - that is, if I have the stomach for it, and if I think there would be enough interest. And I seem to have touched a nerve with you, so I'm not sure I want to rub it. But some of the issues are interesting and important. Sure. If the response seemed overly strident, that was not the intent. Writing a response via iPhone is a pain, so the rebuttal may be a bit more stream of conscious than intended. Let me simplify. Cecilia's article argues players have more agency in the "new" D&D game iterations. You appear to refute that by saying "No, old school iterations of D&D have more player agency" and you cite some examples. The problem is that you are both arguing the wrong points. So, let me simplify what I believe the problem with the premise is, and then perhaps we can go from there. You seem to be claiming that the "new school" D&D makes the players puppets, but "old school" D&D does the same thing in any long-running adventure? As I noted, this railroad adventure style has nothing to whether you are playing "old school" or "new school". It is an issue specific to adventure design when writing a campaign-length module, regardless of which version of D&D you are playing. Overly strident? How could I ever have thought that? :) But I appreciate it. With respect, I think you missed that my general point was somewhat qualified. More later. Well, you (Oakes Spalding) claim two intro-to-DMing modules like B1 and B2 somehow represent the "Gygaxian playstyle"... that's quite a claim. These modules were written to give new DMs a leg up in helping them to entertain their players. It's no surprise they are no workshops on adventure module design because TSR had that not figured out back then themselves... They were by their nature open-ended because they were to set up example setups from which a DM could roll his or her own. I personally think there is a good amount of accident involved here. I agree with Marty Walser that a false equivalency is made by putting the problem on the edition when in any edition you can count the occasions of where published material runs counter to the puppet trend you described ithout "needing both hands." The OSR can only be cited as an example of what people did at their home tables _before_ the modules emerged (because it took TSR a while to realize there's money to be had in modules). But this may very well be a heavily redacted history. Especially since we only ever hear about upsides, seldom about drudgery, boring dungeon runs, etc. But to me there is no virtue per se to old school rules. It can be argued that a 4e encounter needs more planning and hence prep and you could also argue that therefore a DM is more likely to railroading his players into it. So, I would be interested in a follow-up about how the OSR does it better. Because I see a lot of OSR modules out there... maybe I'm missing something here about what aspect of the OSR you are trying to highlight. I agree actually both with Marty Walser and Oakes Spalding. Many players like being puppets as long as the strings are not too visible. As soon if I loosen the rails there will be confusion, then downright boredom and antagonism - from some, not all. Many prefer a breadcrumb trail that I lay to the solution and feel clever if they follow them. This player exists. But it always existed, I think. And modules were always written for those people and had the same limitations. Marty quotes some valid material about old railroad vs new railroad. So, what is your ideal mode of play? That would be a worthwhile article I would definitely read. All the best. Well, in fairness, I did cite those other plotless non-TSR published modules, which beat B1 and B2 to the stores. My assumption is that plotted published modules developed in part due to marketing considerations (which, in and of itself, is not a criticism). Having a plot - defeating those Giants or those Drow or whatever - gives the buyer something to sink his teeth into. And it also announces that you're buying something "professional" that you probably couldn't just do yourself.